Medical tourism is the practice of traveling across international borders with the intention of accessing medical care, paid for out-of-pocket. This practice has implications for preferential access to medical care for Canadians both through inbound and outbound medical tourism. 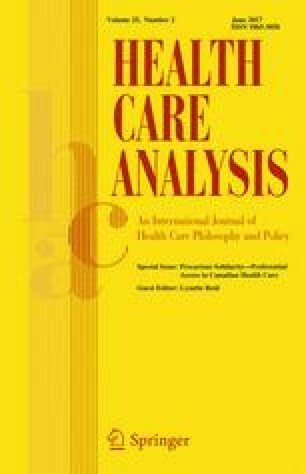 In this paper, we identify four patterns of medical tourism with implications for preferential access to care by Canadians: (1) Inbound medical tourism to Canada’s public hospitals; (2) Inbound medical tourism to a First Nations reserve; (3) Canadian patients opting to go abroad for medical tourism; and (4) Canadian patients traveling abroad with a Canadian surgeon. These patterns of medical tourism affect preferential access to health care by Canadians by circumventing domestic regulation of care, creating jurisdictional tensions over the provision of health care, and undermining solidarity with the Canadian health system. R.J. holds a Doctoral award from the Canadian Institutes of Health Research. V.A.C. is funded by a Scholar Award from the Michael Smith Foundation for Health Research and holds the Canada Research Chair in Health Service Geographies. Bounajm, F., Labonté, R., & Runnels, V. (2015). Should Canada’s hospitals open their doors to medical tourists? Health care in Canada: An economic growth engine. The Conference Board of Canada. http://www.conferenceboard.ca/e-library/abstract.aspx?did=7003. Canadian Broadcast Corporation. (2010). ‘My heart, my choice,’ Williams Says. CBC, February 23. http://www.cbc.ca/news/canada/newfoundland-labrador/my-heart-my-choice-williams-says-1.879413. Doyle, J. R. (2010). Canadian premier’s heart surgery plans raise questions about health care. Fox News, February 4. http://www.foxnews.com/story/2010/02/04/canadian-premier-heart-surgery-plans-raise-questions-about-health-care/. International Medical Tourism Journal. (2014). Canada, Turks and Caicos: Fly the doctor and the patient to an island. International Medical Travel Journal. http://www.imtj.com/news/?entryid82=438527. Trotter, M., & Fionda, F. (2015). Public hospitals profiting from foreign patients. Global News. http://globalnews.ca/news/1865846/public-hospitals-profiting-from-foreign-patients. Turks and Caicos Weekly News. (2013). First hip repl acement performed at local medical centre. Turks and Caicos Weekly News. https://tcweeklynews.com/first-hip-replacement-performed-at-local-medical-centre-p3538-1.htm.